Used Listings For Sale by A. Green Co.
We have 47 listings for A. Green Co. listed below. Find items by using the following search options. You can also click on the column heading to sort through the listings. For more information on an item, contact the seller directly. Airflow Systems PowerBooth Dust and Fume Collector, 4,000 CFM, Large Dust Drawer, Auto-Clean Filter Cleaning System, HEPA Filters, Pressure Gauge, On Casters, 5Hp, New 2015. Barrett Model 1101-SE Sludge Extractor, 4.5 cu. ft./425 lb. Pan Capacity, Pan, Cart, Discharge Tub, Wrench, Lift Hooks, Spare Parts, New 1984. Blanchard 60" Model 36-60 Vertical Rotary Surface Grinder. 60" Magnetic Chuck with ~5/8" Life, ~30" Under Wheel, Segmented Wheel Chuck, 60Hp/3/60 440 Motor, Wheel Dresser, 4 Chuck Speeds, External Electric Box, Remade Guards, Base is filled with Concrete, New in 1957, Reconditioned in 2016. Bridgeport-Romi 16" x 40" EZ Path CNC Lathe, 37.5 - 3000 RPM, 1.97" HIS, 8 Hp, 10" 3-Jaw Chuck, Dorian Quick-Change Tool Post With Misc. Holders, Dual Electronic Hand Wheels, In/Met Dials, Steady Rest, Tailstock, Coolant, Manuals, New 1995. 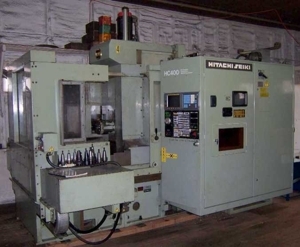 20" x 87" Clausing Metosa Model C2087 Engine Lathe, Inch/Metric Threading, 45-1,600 RPM, 12 Hp, 3" Spindle Bore, 10" 3-Jaw & 15" 4-Jaw Chucks, D1-8 Camlock Nose, Quick-change Tool Post & Holders, Steady Rest, New 1996. Haas Model HA5C Brushless CNC Indexer, 4" Center Height, 0.001 - 410°/sec Speeds, Manual 5C Collet Closer, Model HTS4 Tailstock, Single 17-Pin Connector Cable, Live Center, New 2007. Haas Model VF-8 CNC Vertical Machining Center, Haas CNC Control, 64"X, 40"Y, 30"Z, 36" x 64" Table, CAT-40 Spindle Taper, 7,500 RPM, 20Hp Vector Drive, 20-Station ATC, Rigid Tapping, Programmable Coolant Nozzle, Miscellaneous Tooling, Chip Auger, New 1999. Hamilton Standard Model W3 Electron Beam Welder, 150kV, 50 Milliamps, 52" X 36" X 36" Chamber, Beam Controller Replaced and Software Upgraded 2015, Digital Gauges Installed 2015, Chamber Viewing Camera, Automatic Pump Down, Originally new 1975. Mori Seiki Model Frontier-MI Vertical Machining Center, MSC-521 (Fanuc 21) CNC Control, 22"X, 16"Y, 18"Z, CAT-40 Taper, 8,000 RPM, 7.5 Hp, 20 ATC, Rigid Tapping, Miscellaneous Tool Holders Available at Additional Cost, New 1996. 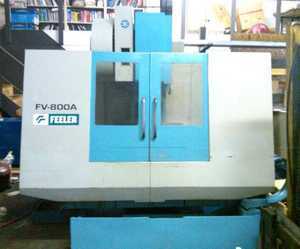 Supermax Model YCM30 Vertical Milling Machine with Bandit 1 3-Axis Control, New 1984. 9" x 48" Table, 3Hp, 30 Taper, Power Drawbar, Bandit Ctrl Model 213-300-33, vises, KoolMist spray coolant. (2) - Used 48" X 120" Cast Iron T-Slotted Floor Plates, 12" Thick, 4 T-Slots Per Plate, Keyed and Matched To Go Together, CAN BE SOLD INDIVIDUALLY.